A yorishiro (依り代・依代・憑り代・憑代) in Shinto terminology is an object capable of attracting spirits called kami, thus giving them a physical space to occupy during religious ceremonies. Yorishiro are used during ceremonies to call the kami for worship. The word itself literally means approach substitute. Once a yorishiro actually houses a kami, it is called a shintai. Ropes called shimenawa decorated with paper streamers called shide often surround yorishiro to make their sacredness manifest. Persons can play the same role as a yorishiro, and in that case are called yorimashi (憑坐, lit. possessed person) or kamigakari (神懸り・神憑, lit. kami possession). To many (animists) they are the natural residence of spirits, kami in the case of Japan. Yorishiro and their history are intimately connected with the birth of Shinto shrines. Early Japanese did not have the notion of anthropomorphic deities, and felt the presence of spirits in nature and its phenomena. Mountains, forests, rain, wind, lightning and sometimes animals were thought to be charged with spiritual power, and the material manifestations of this power were worshiped as kami, entities closer in their essence to Polynesian mana. Village councils sought the advice of kami and developed the yorishiro, tools that attracted kami acting like a lightning rod. Yorishiro were conceived to attract the kami and then give them a physical space to occupy to make them accessible to human beings for ceremonies, which is still their purpose today. Village council sessions were held in a quiet spot in the mountains or in a forest near a great tree, rock or other natural object that served as a yorishiro. These sacred places and their yorishiro gradually evolved into the shrines of today. The very first buildings at shrines were certainly just huts built to house some yorishiro. A trace of this origin can be found in the term hokura (神庫), literally meaning "deity storehouse", which evolved into hokora (also written with the character 神庫), one of the earliest words for a shrine. Most of the sacred objects we find today in shrines (trees, mirrors, swords, magatama) were originally yorishiro, and only later became kami themselves by association. The most common yorishiro are swords, mirrors, ritual staffs decorated with paper streamers called gohei, comma-shaped jewels called magatama (勾玉 or 曲玉), large rocks (iwasaka (岩境) or iwakura (磐座), and sacred trees. Kami dwell often in unusually shaped rocks or trees, or in caves and earth mounds. Yorishiro can also be persons, and in that case they are called yorimashi (憑坐). Because of Shinto's nature, yorishiro are often natural objects like trees. Significantly, in ancient Japanese texts the words 神社 ("shrine"; now normally read as jinja) and 社 were sometimes read as yashiro ("sacred place"), but also sometimes read as mori ("grove"), reflecting the fact that the earliest shrines were simply sacred groves or forests where kami were present. (Part of the reading disparity may have been due to the confusion between similar characters 社 and 杜.) Many shrines still have on their grounds one of the original great yorishiro, a great tree surrounded by a sacred rope called shimenawa (標縄・注連縄・七五三縄). Now such trees have become divine by association, and no longer simply represent a kami. Shinto altars called himorogi are usually just square areas demarcated with sakaki (Cleyera japonica) at the corners supporting sacred border ropes (shimenawa). A branch of sakaki at the center is erected as a yorishiro. Rock sects are also common. 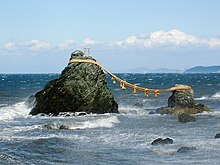 An iwakura is simply a rock formation where a kami is invited to descend, and is therefore holy ground. With time, through a process of association, the iwakura itself can come to be considered divine. Archeological research in Japan confirms these sects to be ancient. In shrines, even today stones considered to be related to the shrine's kami are used to make food offerings to the kami. An iwasaka is a stone altar or mound erected as a yorishiro to call a kami for worship. The concepts of iwasaka and iwakura are so close that some suggest the two words are in fact synonymous. Yorishiro are, however, most numerous in people's homes. During the New Year's holidays people decorate their entrances with kadomatsu, which are the yorishiro of the new year's kami. Kamifuda, pieces of paper representing the kami, are hung above the door. There are kami who dwell in the toilet (benjō-gami) and in the well (suijin). The kamado-gami lives in the oven, and its function is to protect the house from fires. Other common yorishiro are the small altar called kamidana and the butsudan, which is an altar for the dead. (Butsudan were originally meant just for Buddhist worship, but now often contain also spirit tablets called ihai, which are yorishiro used to recall the spirits of one's dead ancestors). In shops one often sees clay cats with a raised paw called maneki-neko or rake-like bamboo objects called kumade supposed to attract good business. ^ a b c d Okada, "Yorishiro"
^ a b Sugiyama, "Himorogi"
^ a b c d Sugiyama, "Iwakura"
^ a b Sugiyama, "Iwasaka"
Nakamaki, Hirochika (1985-10-01). "The "Separate" Coexistence of Kami and Hotoke - A Look at Yorishiro". Retrieved 2008-10-22. Okada, Yoshiyuki (2005-06-02). "Yorishiro". Encyclopedia of Shinto. Retrieved 2008-07-18. Sugiyama, Shigetsugu (2005-06-02). "Iwakura". Encyclopedia of Shinto. Retrieved 2008-07-18. Sugiyama, Shigetsugu (2005-06-02). "Iwasaka". Encyclopedia of Shinto. Retrieved 2008-07-18. Sugiyama, Shigetsugu. "Himorogi". Encyclopedia of Shinto. Retrieved 2008-07-18. Tamura, Yoshiro (2000). Japanese Buddhism - A Cultural History (First ed.). Tokyo: Kosei Publishing Company. p. 21. ISBN 4-333-01684-3.